A little over a month ago, over 375 developers attended the 2015 engineers4engineers conference that was held at Constant Contact’s Innoloft. This was our third, and thus far the most successful, conference. But what is the engineers4engineers conference? E4E is a free, invitation-only conference held at our corporate headquarters in Waltham, MA, just outside of Boston. We draw people from all over Boston, including different technology bootcamps and tend to focus more on junior developers and less on people who get to go to a dozen conferences every year. Because it’s a free conference, it reaches developers whose employers can’t always afford to send their employees to expensive conferences on the west coast. Why does Constant Contact sponsor it every year? We have several goals when putting on this conference, and a key goal is to promote diversity in tech. Half of our speakers (keynotes & sessions) this year were women. No matter what, speaker selection is a difficult and time consuming process, but thanks to ongoing & industry wide effort towards diversity, it was easy to find great women speakers. Among our other goals, we strive to build our tech brand in the Boston metro community and develop internal employees. It’s important to us to expose our engineers to new ideas and technologies and to give them speaking opportunities. To that effect, 5 of our 14 speakers were Constant Contact Employees, as were 1/3 of the attendees. Every Constant Contact engineer has an opportunity to attend at least one additional conference of their choice every year (e4e doesn’t count). Out of a total of 425 developers registered in 2015 (our max capacity), 375 attended on September 18th, 2015 (a few no-shows are expected since this is a free event). We ran a survey a few weeks later and got a 20% response rate. Our Net Promoter Score was 67, with a 63 for internal participants–we’re our toughest critics. 80% of the respondents were very likely to attend e4e 2016 and 17% were somewhat likely. If you didn’t attend in 2015 and would like to receive an invite for E4E 2016, go here to sign up. Watch the video below, or go here to watch our 2015 sessions & keynote. 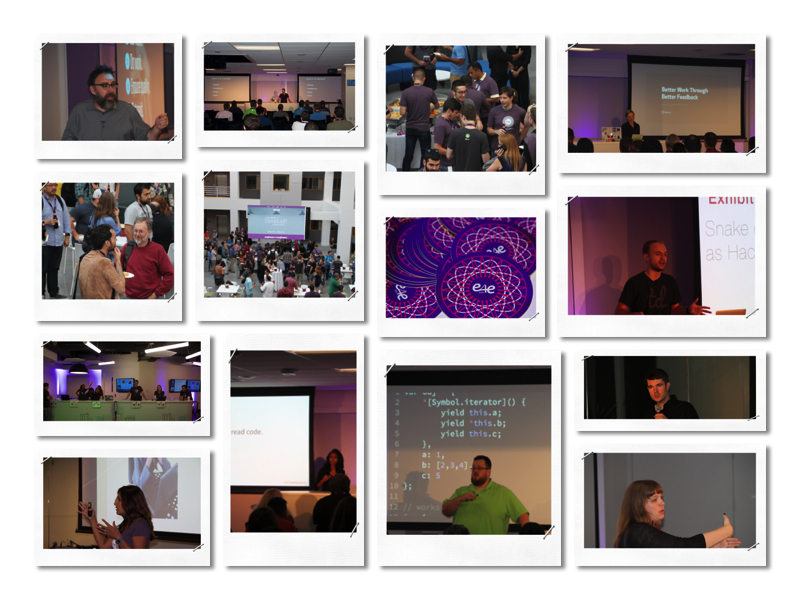 Recordings of our 2014 keynotes & sessions can be found here. 2015 was a great year for the engineers4engineers conference, and we have plans to make next year even better. We would like to thank all that attended, and the large team that helped put it together and worked tirelessly, including our HR team, IT, UI/UX and the rest of our organizing team. Seems like an inspiring conference!! I want to go! !